Fellow blogger Pedro Burelli has confronted OAS' Secretary General José Miguel Insulza, by way of questioning his silence with regards to the indictment that the Inter American Commission on Human Rights (IACHR) published this week against Venezuela. Insulza then tries to get out of it, arguing about there not being precedent of a Secretary General commenting on IACHR reports, for its a totally independent body, etc. Using OAS tenure and position to promote personal political career. Using OAS tenure and position to support anti-democratic and unconstitutional measures. Using OAS tenure and position to support dictatorships. 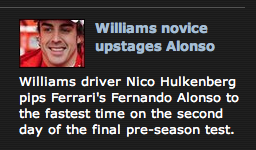 BBC institutional bias against Fernando Alonso? This is something I would like to ask to those commenting on F1 pre-season. Yesterday, BBC's F1 website posted an article entitled "Novice Nico Hulkenberg upstages Fernando Alonso"
The much hyped Lewis Hamilton also took part in that day's test, and so did Michael Schumacher. Now I don't think is necessary to insult people's intelligence by stressing that both Hamilton and Schumacher are world champions, the latter widely considered the greatest of all time. But the editorial team did not considered fitting to title the article "Novice Nico Hulkenberg upstages Michael Schumacher". And perish the thought of a headline such as "Novice Nico Hulkenberg upstages Lewis Hamilton", both of which would have been equally correct. So my question is simple really: what is the reason of the BBC's bias, as far as F1 reporting is concerned, against Alonso? Is it because of his, fortunately, brief stint at McLaren? Is it because of the nature of its funding (British taxpayers)? Mind you, Hulkenberg upstaged everyone that day. Why did editors saw fitting to chose one particular name, over all the rest? Readers will remember that two days after HRW published a report about systematic violations of human rights in Cuba, an inflamed mob of state-sponsored thugs attacked journalist Reinaldo Escobar in Havana, thus providing confirmation of how correct HRW's report was. The fact that political prisoners on hunger strike are left to die, isn't improving Cuba's human rights appalling record. The kangaroo courts of Hugo Chavez, not to be outdone by the other dictatorship in the region, annulled election of anti-Chavez mayor yesterday, the very day the Inter American Commission on Human Rights (IACHR) published a scathing report, which criticises the lack of independence in Venezuela's judiciary, and the constant encroachment of civil and political rights. It is worth noting, as explained in IACHR's report under "The modifications of the powers of elected authorities", that this is just another instance -remember Antonio Ledezma- in which a democratically elected official is stripped of its powers and office by the Chavez regime. In the meanwhile Venezuelan diplomats are exposed by the IACHR as nothing but liars. Perhaps in trying to grant some recognition to Venezuela's social agenda, the report repeated, in point 993, that UNESCO had declared Venezuela "a land free of illiteracy", according to the Venezuelan State. As my readers know, that claim is just another lie of the Chavez regime. But then again, had IACHR officials been allowed into the country, as requested since 2003 without success, they would have surely realised how fallacious such a claim is. Los participantes podremos discutir, bloguear, twitear, etc., sobre temas de actualidad que nos afecten. Esto será publicado en el blog de la BBC en tiempo real. Lo interesante es que las conversaciones que tengamos, por ejemplo, los blogueros venezolanos sobre el asalto a la democracia y a la libertad de expresión, podrán ser comentadas por blogueros de otras partes del mundo, exponiendo sus opiniones desde un punto de vista geopolítico, sobre cómo lo que sucede en un país afecta a otro, y viceversa. Yo en lo particular, propongo que los venezolanos hablemos sobre lo ya comentado, y temas relacionados. Los cubanos pueden discutir el embargo, habida cuenta de las preguntas que Val le hiciera a Yoani recientemente. Los hondureños podrían hablar sobre el rechazo del Grupo de Rio al presidente constitucional, y democráticamente electo de su pais. Los brasileros sobre la nueva figura en el PT de Lula, y Jose Serra de cara a las presidenciales, los argentinos de Las Malvinas..., en fin, cada quien puede hablar de lo que le parezca con personas de su país, y en su propia lengua. Karnie Sharp de la BBC, me comentó que podemos invitar a este evento a quienes consideremos pertinente. Por tanto pido a mis lectores que corran la voz para que, juntos, podamos exponer a una mayor audiencia nuestras preocupaciones. Al final de la jornada el tema que haya atraído mas comentarios y participación a nivel mundial será objeto de la conversación final. Este es un ejemplo de cómo debe funcionar la democracia, donde las mejores ideas terminan siendo aceptadas por la mayoría. The BBC is organising a blogging event here in London, 18 March, that seems an extraordinary initiative: bloggers from around the world will be able to live blog, tweet, buzz -insert preferred method here-, conversations about issues affecting them, in their own language! This will in turn be posted/broadcast across BBC platforms, such as BBC World TV, World service radio, BBC Blogworld, and BBC World Have Your Say. I am honoured to have been invited to this event, that has been referred to as a "social experiment", and can only hope that our opinions will be heard far and wide. The event will take place in Shoreditch Town Hall, on the 18th of March, from 1300 - 1900 UK time. In the words of BBC's Karnie Sharp: "Just to say I came out of a meeting just now, and the editor in charge spoke about the conversations being brought down to ONE conversation at the end of the day. Our central site will link to all conversations, BUT the one most gathering interest across the world would probably be the final conversation the "world" will have or lean towards." An online show of democracy at work folks!! "En mi criterio, actualmente esta organización está muy lejos de cumplir los fines para los que fue creada. Ha sido minada por la burocracia, la ausencia de discusión, el clientelismo, el grupalismo y un mal entendido concepto de la lealtad." 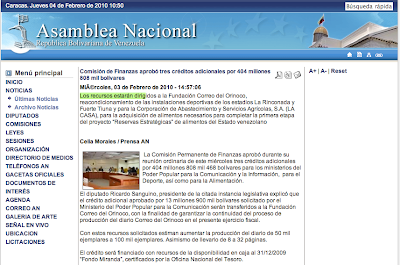 "In my opinion, this organisation (PSUV) is currently very far from the goals for which it was created. It has been undermined by bureaucracy, absence of debate, clientelism, group thinking and a misunderstood concept of loyalty." I must say that Henri Falcon has provided us with one of the most succinct and precise definitions of chavismo. Other chavistas are empathising with Falcon. Trouble ahead for the putschist? El "por ahora" se convierte en "¿y ahora?" He aqui un chavista arrepentido, que ha votado muchas veces por Chavez. El se pregunta, ¿y ahora? Ahora es cuando van a pagar todos los venezolanos, hayan votado por Chavez o no, las consecuencias de tener un megalómano galopante e inepto en el poder, debido a las muchas veces que gente como Omar ha votado por el militar golpista. ¿Y ahora? Alpargata que lo que viene es joropo, o mejor aun, chupense ese caramelito de pus. To justify the suspension of RCTVi by cable companies, Minister Diosdado Cabello has recourse to all sorts of arguments. He started saying that RCTVi had to comply with the limitations and regulations imposed on national TV companies, given it had broadcast a high percentage of locally produced content, during the 4 months prior to 22 December 2009, when new regulations were published and came into force. It just so happens that in the 4 months period described, RCTVi could have broadcast 100% of nationally produced content, for at that time, laws regulating allowed percentages of national versus internationally produced content were not even in place, ergo there were no limitations in this respect. The insistence in applying the law retroactively, that is during the 4 months prior to the date it came into effect, breaches the principle of irretroactivity of law. Given national and international condemnation for the violation of this universally accepted principle, the government then argued that CONATEL (Venezuela's media watchdog) had not shut any channels, it was rather cable companies that had decided to remove RCTVi signal from its programming. It was evident for all, as reflected in the OAS communiqué, that the government threatened cable operators, if these failed to take off its programming TV companies that did not comply with the law. These companies, without written warnings, in total absence of administrative or legal procedures, without sentence or court orders, bowed to the government's pressure. This sets a grave precedent in human rights in Venezuela, for the government used private companies as instruments of repression. Lastly, despite the fact that RCTVi had filled paperwork required by law with CONATEL, on 13 January 2010, that is to say, two days before the established deadline, the government tried to justify its decision arguing that RCTVi had not presented itself before the watchdog, "adopting an arrogant stance." On 8 February, RCTVi filled required documentation again, this time with CONATEL's legal council, that officially acknowledged receipt of paperwork, for the second time. 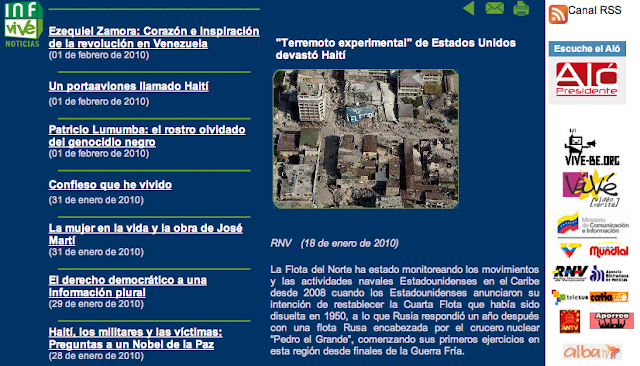 On 11 February, CONATEL replied to RCTVi, accepting that RCTVi had, in fact, handed in required paperwork and relevant documentation in the dates described, however it ruled that RCTVi was classified as a national broadcaster on the basis of programming broadcast between 22 September and 21 December 2009, that is to say applying the law retroactively, which is illegal and unconstitutional. Thus it remains clear, firstly, that Minister Cabello argument that RCTVi had not gone to CONATEL to hand in documentation was incorrect. Secondly, the decision of classifying RCTVi as a national, rather than international, broadcaster, continues to be supported on a retroactive application of the law. Thirdly, Minister Cabello's intention has always been to exert undue pressure on cable operators so that RCTVi's signal is taken off the programming. IN A small fishing village on the Caribbean coast of Venezuela stands a plinth. Unveiled by government officials in 2006, it pays homage to the Cuban guerrillas sent by Fidel Castro in the 1960s to help subvert Venezuela’s then recently restored democracy. Almost entirely bereft of popular support, the guerrilla campaign flopped. But four decades later, and after a decade of rule by Hugo Chávez, Cuba’s communist regime seems finally to have achieved its goal of invading oil-rich Venezuela—this time without firing a shot. One thing is certain: Ramiro Valdes' visit had little to do with solving electricity problems, and all to do with creating a permanent blackout for freedom of the press and expression in Venezuela. That is about the only area in which the Cuban dictatorship can offer advice to so called democratic nations. Wikipedia is often criticised as unreliable. However noble the original idea of Jimbo Wales, re anyone's ability to contribute and build the largest online encyclopaedia, it remains a fact that is prone to attract, well, anyone willing to add a point of view on a given topic. As Venezuelans are only painfully aware, Hugo Chavez has been attempting to rewrite history, building this notion that, before him, the country was almost uninhabitable, owing to the excesses of a political class that behaved worse than Roman emperors. Needless to say that such simplistic and misinformed notion can only be the product of an utterly ignorant mind. 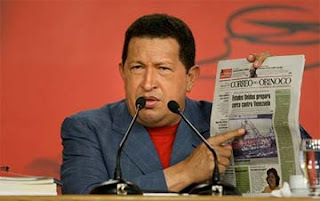 However, there are those who are willing, for ideological and financial reasons, to buy into Chavez's revisionism. These true believers command an editorial power within Wikipedia, in entries related to Chavez or Venezuela, that proves critics' point regarding the encyclopaedia's unreliability. There are many examples that demonstrate that Wikipedia has become, for all intents and purpose, another propaganda outlet of Chavez's growing media empire. 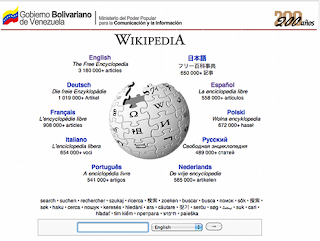 Be it the Venezuela Information Office, Eva Golinger, Mark Weisbrot, or Venezuelanalysis, chavista editors have succeeded in deleting information that, while perfectly sourced according to Wikipedia's editorial policy, does not comply with the version officially promoted by the Chavez regime. A perfect showcase of double speak and circularity of argumentation of these editors can be seen in a very long discussion related to Venezuelanalysis, posted in its Reliable Sources Noticeboard. But then, it is worth pondering upon the reasons why propagandistic views of totally obscure editors, whose credentials no one knows for certain, can be imposed in Wikipedia entries, as opposed to verifiable facts published by truly reputable sources. With regards to Venezuelanalysis in particular, a site officially funded and run by chavista fundamentalists, readers are meant to take views of its editor as valid counter arguments, for instance, to reports produced after two years of research by Human Rights Watch. Only true believers will give any consideration to such untenable positions. However, more disturbing still, is to realise that one of the two editors (other being Rd232) who patrol and protect Chavez entries in the English Wikipedia, known as JRSP, has in the past edited out factual information from Gustavo Cisneros' Wikipedia entry. Tellingly, editors that safeguard Chavez image, also look after Cisneros and terrorist and assassin Rodriguez Chacín Wikipedia entries. Surely, a reliably chavista encyclopaedia! Etiquetas: hugo chavez, venezuela, wikipedia. Here's an admission: I find absolutely fascinating, in this global climate of unemployment, economic hardship, etc., that someone like Eva Golinger finds herself thriving in Venezuela. For various reasons, but principal of which that Venezuela is not in a position to be wasting money in harebrained ideas. Golinger, whose professional life in her country (USA) ran a rather brief course, until I exposed her as having cheated the IRS and the American public, has just been awarded by Venezuela's Congress some $3.2 million to increase distribution of a propaganda rag she's just launched, called Correo del Orinoco. I expect fanatics to take whatever Golinger publishes there as the fountain of ultimate truth, however one would think that in light of the enormous problems currently affecting all Venezuelans, $3.2 million could be better spent. Surely a sign of Chavez's sheer irresponsibility, and of the independence of Golinger, in case she ever enjoyed benefit of doubt. Perhaps the IRS should send Golinger a few questions? Did Chavez say Haiti earthquake was caused by USA? Must admit, I have been a bit slow on some developments lately, however upon reading this morning the news about whether or not Chavez said that Haiti's earthquake had been caused by some "earthquake weapon" operated by the US Navy, I decided to dig a little to establish who said what. The Venezuelan führer did not say that Haiti's earthquake was caused by the US, or its "earthquake weapons". 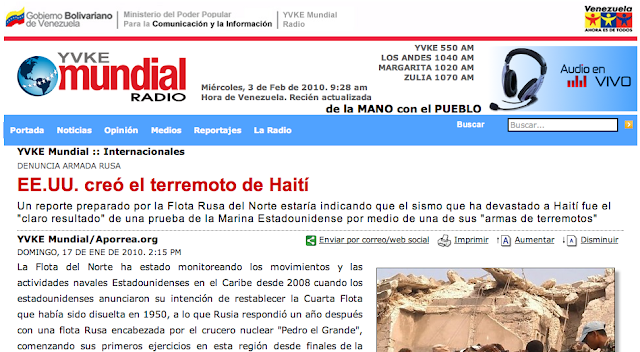 However, articles containing information about a so called "experimental earthquake", caused by the USA according to "Russian sources" were published in five propaganda outlets of the Chavez regime, see below. Therefore, I reckon reports saying that Chavez said so, although not exactly accurate, can be forgiven in light of the stuff published by official Venezuelan "information" outlets. Chavez ta ponchao: Where's BBC professionalism when most need it?